Lord Narasimha as Ganda Bherunada (two-headed bird) is a rare incarnation of Lord Vishnu and is mainly worshipped in South India. Gandabherunda, or Gandha Bherunda Narasimha, is a combination of bird and animal with two heads and said to have manifested from Lord Narasimha as he was not able to control his anger. 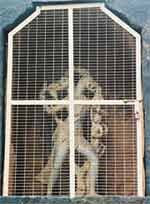 It is also believed that Ganda Bherunada incarnation was answer to Lord Shiva’s Sarabha form. This is also the emblem of Karnataka State in India. Ganda Bherunada is not mentioned in the Bhagavad Purana but is mentioned in the some regional scriptures and in some Puranas. Legend has it that Lord Vishnu took the form of Narasimha (half-man half-lion) to annihilate Demon Hiranyakashipu. But after completing His divine mission, Narasimha could not control his anger and turned to destroy the universe. Lord Shiva took the form of Sarabha to pacify Narasimha. But Lord Narasimha took a more terrible form of bird-animal with two heads – Ganda Bherunda. The most famous drawing of Ganda Bherunada is found in the Mysore Court. 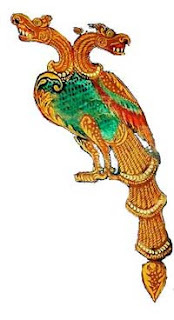 A bird of the form of Gandabherunada is the royal logo of Wodeyars, the former rulers of Mysore. A murti of Ganda Bherunada is worshipped at Sri Yadagiri Temple near Hyderabad in Andhra Pradesh. There is a sculpture of Ganda Bherunada at Balligavi town in Karnataka. Idols, paintings and sculptures of Ganda Bherunada are very rare and those that are available are mainly found in Andhra Pradesh, Karnataka and Tamil Nadu.